When we look up at the Full Moon this month we see an image upon which we have gazed so many times before with various emotions and thoughts perhaps influenced by the sign that is occupied by our luminous friend. Perhaps by what we feel reflected to us through the light that is our nature—all else will fall away. The structures that we have built for safety and security fall away and the desire for freedom and the subsequent realization of our lack of freedom are plainly evident. The Heart opens and the need for structure is no longer defined. This all a tremendous experience in Capricorn as the sea-goat has made its way to the mountain top and with lofty view realizes that the structure is like a ladder but as I never needed to climb anywhere, the ladder serves no purpose and what has been learned is now applied to serve the structure that is humanity. I discover my humanity deep within the truth of Be-ing. No need to whine, worry or wonder you that stand between your suffering and surrender. You cannot resist and live to tell the story! We’re all going down—but to rise into the light of liberty and joyous community, the structure that exists for eternity. When all else fails, Love prevails. While we are at it here, might as well feel deeply all that is taking place—the sadness, grief, anger—anger moves us—anger is the energy that takes us from A to B. In sadness we sit. We should deny none of it. All of it is the One. Capricorn is an earth sign, an opportunity to ground into physicality with the benefit of our vision to Be “that” or Love here—deep, intimate oneness in this body, here, now. There are several planets shifting signs or direction in the two weeks between this Full Moon and the next New Moon (July 26th). Not a common occurrence. This represents a time of change that allows for deeper feeling. 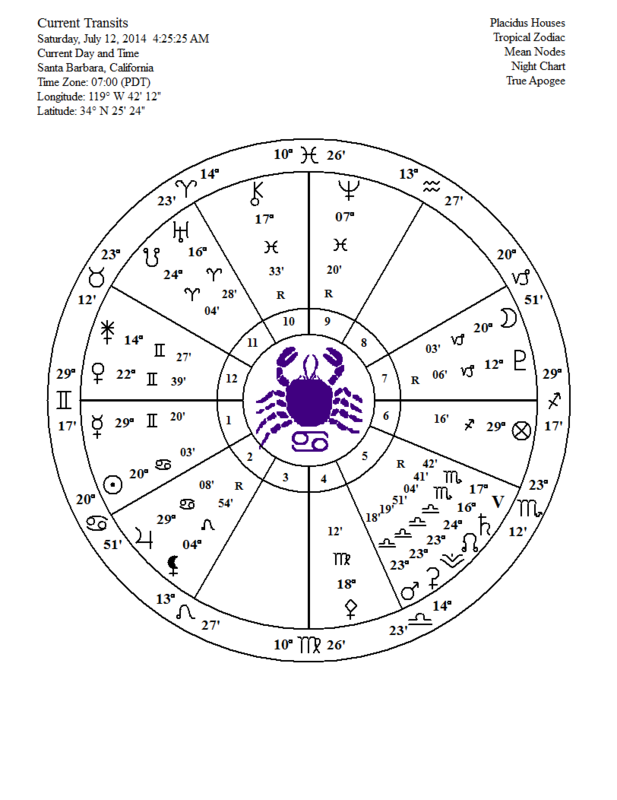 Mercury moves into Cancer on the 12th/13th depending on which coast you live on. Thought and communication originate from a deep place of feeling; less verbal expression. Venus follows into Cancer on the 18th. It is about what we desire that lifts us out of old patterns of want. On July 16th Jupiter moves into Leo. All of our grand gestures and wisdom are devoted to what feels good. It is not about short term gain or what strokes the ‘ego’ necessarily but what supports our long term well-being. Leo rules the heart. What a heart expansion we are experiencing! Saturn goes direct! July 20th, for some, is the long awaited date for the task master moving again and therefore not hammering home the same point over and over. We can now get on with what we have discovered while rooting through the cellar in the dark, digging up stuff that has stubbornly evaded scrutiny. Or that has disguised it self as necessary to our survival. And too, we may have been faced with fears based upon some very old thoughts that arise then are seen to be nothing more than the breeze that rustles the leaves. For some this may feel like a strong wind rattling the shutters. We settle into the comfort of knowing the Self once again in peace and Love. 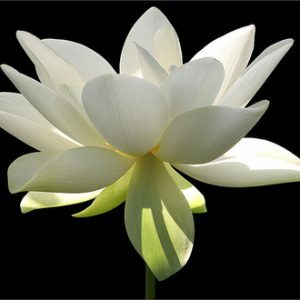 The healing comes easily to us, spreads quickly from the center outward soothing, caressing and nurturing in a way that only Truth can. It has slipped between the resistance and the beliefs from the inside out and shattered all the incongruities that have just never made sense giving rise to numerous, numerous questions that of course have no answer. Then on July 21st Uranus stations retrograde. What happens when the planet of evolution, change and awakening slows down in Aries (I seek Self)? More internal inquiry. What stands in the way of Liberty? This question may be asked so many times during the course of a lifetime, especially for those determined to get to where they have always been. Abrupt change is very possible and may become ordinary; dropping everything that has always seemed fine in favor of a quest that takes one into the unknown. Instinctively we know this is where our truth lies, beyond the known world. The will and the way join hands in gracious allegiance. By the 24th as the New Moon approaches and Mars slides into Scorpio we should be filled with insight, many ah, hah moments that bring a smile—further relaxation into our perfection. There is an intensity to these days that manifests in various physical issues from exhaustion to a disorienting dizziness and feelings of nausea. There are no reminders of what should be, how one should or should not conduct themselves. Instead each individual is called upon to utilize their intuition as to what best serves them. And many things are available to us; many beautiful people are present to show the way if we find our selves in a place where we want to see our own luminous reflection. The doors are open just walk through. We may begin by gazing at this Full Moon. Being filled with gratitude and nothing else is a moment of Love and joy. And that is all there is. We have this glorious moment, this present and our heart the jewel that provides us everything. A Full Moon in Sagittarius, what a glorious opportunity to see our full potential! This chart supports every inch that we proceed in that direction or every mile our heart leaps in pursuit of our desire. What is that desire? If the answer to this question is unclear, gazing at the fullness of the moon may provide important clues. As you peer into the luminous surface allow your self to proceed deeper into the light—fall into the light. Immerse your self in the light and observe what springs up all about you. If awareness comes to you then so may the gift of being here fully. The truth spreads about us in a way that we can not deny our greatest desire—to Be present, authentic and all that flows from the heart without fear or hesitation—embracing our humanity, embracing humanity. There are several exact aspects in this Full Moon chart that point directly to what we will integrate over the next several days. Other than the Sun/Moon at 22 degrees, Jupiter in Cancer occupies this number as well, quincunx Moon and semi-sextile Sun. Not going to overflow with enthusiasm or an expanded sense of self unless it applies to the greater understanding of Self. There is no knowing other than not knowing. There is no personal sense of identity as this does not serve Truth. There is no sense of personal accomplishment as it has little meaning compared to beauty of full expression. Truth, wisdom, expression from the heart is the only expression that matters. Then the sense of expansion into source, am that source is embodied. Blissful, peaceful, love-ful swim in the light of this Full Moon. Next we take a look at the Saturn/Venus opposition that includes Chiron also at 17 degrees, trining Saturn and sextile Venus exactly. Chiron, the healer makes easy aspect to the planets in opposition suggesting that to heal, release of insecurity, feelings of inadequacy and self judgment come about through a deep knowing of the self as perfect. As perfection there is no need for any thing external to fulfill me and suffering ends. My greatest desire fulfilled—recognizing my self as the object of my love—one and the same. The last two planets in exact aspect are Pluto and Mars at 12 degrees in square to one another. The brilliant aspect of these two powerful forces at 90 degrees inhibits one way or another, the fulfillment of desires that serve only to support the individual. Confronting the darker side of human nature is a way of eventually creating energy free of this need in order to eliminate such influences from one’s experience. We may all have an opportunity to examine some sliver of sordid human behaviour in order to transcend same. It is also an opportunity at the same time to recognize that it may be someone else perpetrating a ‘wrongdoing’ but in some way I too am responsible as we are all one here. No one suffers alone. Just as when one awakens to the Truth we are all lifted into the light. Jupiter rules Sagittarius so has significance as a result of this relationship. We have seen that it aspects the Moon and the Sun. It also squares the north and the south node. The point to which we aspire based on what we have learned in the past (north node) and leaving the past (south node) to be present now. South node in Aries, searching for Self, bringing forward all that one has experienced in this pursuit through the wisdom and expansive nature of Jupiter en route to knowing Self as balanced through surrendering to, accepting and allowing the Truth to arise, dissolving illusion. Jupiter is the optimism through which we know everything is possible, there are no limitations and in Cancer, love embraces us in the womb of creation, endless, effortless, eternal—nothing to resist. The degree of the Moon is 22, a master number that refers to understanding the nature of duality. When this is accomplished and we are immersed in the knowing of Reality, all things come to us easily, with grace. In physicality we are the Divine, Beloved and so experience existence from knowing that it is as it is—and why not? No resistance. The arrow of the archer, Sagittarius, points heavenward. In the tautness of the bow is enormous potential to attain great heights. Optimism and the passion to realize Truth point in the direction we travel always with an added measure of encouragement during these several days before and after this Full Moon. Let your destination be the very place from which you began. …that simply express–what deeply motivates you as you interact on a daily basis. Gemini can find numerous words to describe any situation. Like the crow they are attracted to everything shiny and like a rat they can collect; for Gemini moon collecting information that offers a sense of emotional security. As there is a square to this Sun/Moon from Neptune in Pisces ‘mere’ words will prove to be inadequate and your quest for stability will be unsuccessful if you continue to think that what supports awakening has anything to do with what can be found outside of one self. Information contributes to building structure that on the surface appears to support our existence but in no way expresses the truth of Being. At this time the illusion that we have constructed will sag, exhibit holes, deteriorate as the mind, that Gemini is famous for utilizing so adeptly, sees clearly its own limitations, dismantles it self allowing the light to permeate all things. All things are light and in that there is no separation. The mind rests and words become a tool for sharing the simplicity of what is, a very beautiful expression of that which motivates us on a deep level—inner peace. One word in the stillness has greater effect than any speech delivered from a scholarly pulpit. A single drop of water creates a ripple across the surface of a pond that like a mirror reflects to us who we truly are. With the mind at rest during this New Moon or at least, discovering what perpetuates disturbance and nurtures weakness/fear, a clearing out occurs as balance and peace spread across terrain that once rose and fell with alarming abruptness. The roller coaster ride ends. There is no longer a desire to experience the sensation of weightlessness that two opposing forces create. For this to happen, the opposing forces must be in perfect balance, a very temporary condition in duality. The gift of Gemini is the opportunity to realize that perfection is, and balance is—it is duality seen for what it is and knowing that that is not reality. A trine from Mars in Libra at this time lends energy to this recognition; to the ‘understanding’ that what we are not, the body, leads to not a complete demise of action but reveals that action occurs—not as a result of anything ‘I’ do but as the result of the constant eternal flow of “that”, our true nature. There is “that”, includes time/space, they too are relative. The freedom that results, the liberty to Be, is peace, is love, is beauty and gratitude for this awareness is eternal. With Mercury at 29 degrees Gemini we can be sure that realization is the last bit of information that this sign assimilates. And with Venus at 29 degrees Aries we are aware of what truly motivates the individual here. These two planets hand in hand stimulate a powerful desire to overcome our attachment to who we think we are—this mind, this body. We realize the truth of what we have been missing that replaces this notion that I can get it through anything this mind or body does. Words do not remotely enter into an understanding of that and the mind has no idea of what that is.